Juan Downey’s work is a lot things—interactive sculptures, hand drawn spreadsheets, happenings that combined audience, dancers and physical sculpture—but for me it is time travel. Maybe it’s the rack of old school light bulbs? Maybe it’s the rough cut chipboard they are mounted behind? Maybe it is their painfully slow reaction time, but when you walk into a room full of Juan Downey’s works, you will, if you were there first time around, be transported into an analogue world. That’s sometime in the late 1960s and ’70s. The kind of place where you sent letters or telegrams not texts and emails, played vinyl albums rather than streaming playlists, drew your own graphics by hand and not with a mouse, and where televisions were convex boxes. A time when activating light circuits and tape recordings by moving your hand in front of sensors was little short of miraculous, and the closest you got to a mobile phone was a handy selection of change for coin-operated phone boxes. Looking at the graphs and charts of Research on the Art World, and before I absorbed what they were actually about, I was drawn to the hand-ruled lines and grids, the erased pencil marks and the generous use of Tipex to cover up mistakes. That’s how it was in the analogue world; it took so long to make anything like this that you were not just going to rip it up and start again. In fact, Downey had sent a thousand letters out to artists, collectors, dealers, curators and assorted elements of the art world, asking them to fill out a typewritten questionnaire and send it back. The graphs and histograms he made from their answers made me laugh. Curators wanted to give creators more power and dealers less, the artists wanted to give artists more power and dealers less. The critics tried to claim that they weren’t really critics, or that the whole exercise was futile. I never found out what the dealers wanted, but I’m guessing from the other folks’ take on things that the dealers were pretty happy with the situation as it was. I was puzzled by the art collectors, whose graph plotted numbers of art objects in their art collection against percentage of art works that they didn’t like; everyone didn’t like a chunk of their art, and the dude who didn’t like half of his huge collection troubled me. All of this data was recycled by Downey to create Information Centre, an installation where sensors respond to body motion, light up graph shapes in light bulbs and play audio of key findings from the survey. I particularly liked the recordings—no doubt now digitised—for their pleasing incomprehensibility; the characteristic garble made by rickety PA systems and the unmistakable hiss of corrupted sound on magnetic tape. It was like standing on a British railway platform in the ’70s waiting for a late train and never any the wiser for the station announcements. Sure, communication systems were primitive by today’s standards, but somehow we still caught trains and had fun. Juan Downey certainly did. 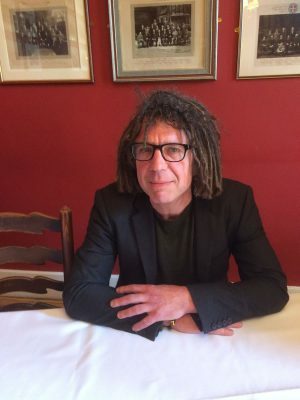 His novel, constructed entirely from conversations in which he only answered yes or no, and mostly conducted with his amused but exasperated friends, is a do-it-yourself absurdist masterpiece. The film of the first outing of the Pollution Robot, shimmers with the blurry reds and oranges of old Technicolor footage and a hand-held camera, but the gag—if you are lucky enough to go when it is in operation—still works. Best of all is Communication. A hand-written note to his friends begins, “1. Groove here until the tape is played”. The lucky invitees then get to listen to the tape and must try and remember what they hear. Then everybody has to split, go somewhere by any means of transport and contact Juan any way they can—carrier pigeon, postcard, phone box—and tell him what the message of the tape was. Then back to Juan’s place for a party and the burning of tapes and messages at dawn, and quite a lot of other good stuff I imagine. That’s the thing. I was standing on Hollywood Boulevard where Communication is on display at LACE (Los Angeles Contemporary Exhibitions). It’s the kind of neighborhood that normally stimulates only the most dystopian of imaginings—but I was transported to Juan’s place. I wanted to be part of Juan’s gang. I wanted to send him a message and get back to that party. There would have been, I’m sure, a lot serious stuff being talked about too. Plenty of Downey’s work spoke to contemporary political issues in Chile and the USA; his Imperialism Octopus created for anti-Vietnam war marches is particularly good. But there would, I imagine, have been a lot of play, a lot of laughter and a lot of wonder. There still is in the works that have been presented and recreated in Pitzer’s Radiant Nature exhibition of his art. Treat it like an invite to his party. Stand in the space. This is the tape. Groove here. Go somewhere else. See if you don’t want to send Juan a message back. David Goldblatt, a visiting professor at Pitzer College, is an award-winning international journalist and author. Juan Downey: Radiant Nature is a joint exhibition by Pitzer College Art Galleries and Los Angeles Contemporary Exhibitions (LACE). Co-curated by Robert Crouch and Ciara Ennis, Radiant Nature brings to life interactive works by the renowned artist Juan Downey that haven’t been witnessed for generations. The exhibition is part of the Getty-led Pacific Standard Time: LA/LA initiative, a far-reaching and ambitious exploration of Latin American and Latino art in dialogue with Los Angeles. 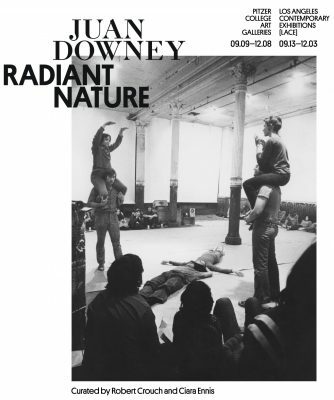 Juan Downey: Radiant Nature runs through December 3 at LACE and December 8 at Pitzer College.